We had been to 4 different vets and they had all told us, Zoi our 6 year old Maltese would never walk again. In November 2012 Zoi started acting stoved up and stiff, within two days she went from stiff to not being able to move her back legs. We had multiple xrays, and a MRI done, with no results. The vets told us they could either put her down for us, or we could take her home but she would never walk. We heard about Dr. Christine from a friend and decided to take a chance. Zoi has been going to her since Jan 2013 and in the first few sessions we could tell she had more movement in her tail. After 4 weeks, Zoi was standing and could move one back leg. After 6 weeks she could take a few steps before she would fall. Now at 8 weeks she is officially WALKING! 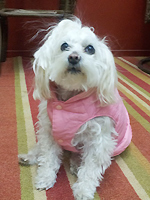 We are so excited and are very thankful to Dr. Christine, without her Zoi would never have been able to walk again.